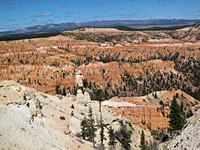 Bryce Canyon, famous for its unique geology, consists of a series of horseshoe-shaped amphitheaters carved from the eastern edge of the Paunsaugunt Plateau. The erosional force of frost-wedging and the dissolving power of rainwater have shaped the colorful limestone rock of the Claron Formation into bizarre shapes, including slot canyons, windows, fins, and spires called "hoodoos". It is also home to some of the darkest skies in the nation, attracting visitors from across the nation to explore a night sky which cannot be seen from their homes in the cities. Each year, 1.3 million tourists visit Bryce, accounting for $108 million in visitor spending, or 60 percent of the economic activity in Garfield County Utah. 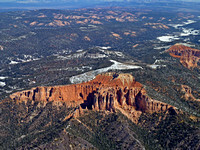 Alton Coal’s nearby strip mine is just ten miles SW of Bryce National Park and threatens the environmental integrity and scenic beauty of the area. Alton Coal is proposing to expand its operations onto public lands near the Park, and extend the life of the lease by 25 years. It will then have the dubious honor of being the only coal strip mine in Utah on federal land. The BLM has acknowledged that the project would have significant environmental impacts, with trucks from the mine kicking up dust, muddying seeps and wet meadows, and destroying sage grouse habitat, and the sage grass that feeds a large deer herd, and flood the night sky with light, diminishing the views of stargazers. Mining operations would require up to 300 coal truck trips per day travelling through the nearby historic town of Panguitch - about one truck every seven minutes. The agency has yet to make a final decision on the expansion. The U.S. Fish & Wildlife Service, National Parks Service and the EPA oppose the expansion.Groups like the Sierra Club and SUWA are encouraging the BLM to deny it, or else face legal action for failing to adequately account for potentially harmful impacts on the area’s water, air, wildlife and cultural resources. 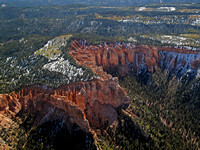 Learn more about the threats to Bryce Canyon Nationl Park through this EcoFlight virtual aerial tour! Alton, Utah - Hollow Coal Strip Mining from EcoFlight on Vimeo.